The Accordion Panel creates an interactive accordion. You configure the component by specifying the panels and their associated content, and by configuring the component look-and-feel. You specify content by creating an H1 for each panel in the Rich Text Editor, and adding content for the panel such as text, images, and tables. 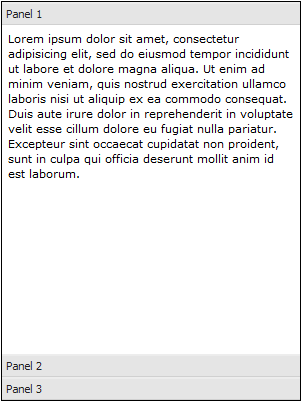 By default, the component includes three panels and associated placeholder text. 1. Open the Rich Text Editor. Select the component in the canvas and press the Enter key. 2. Edit the placeholder content. Each accordion panel must be specified as an H1 using the Heading 1 format. For each panel, you can add any content supported by the Rich Text Editor. The default content is shown below. Single-Expand Select Yes to display only a single panel. Select No to display multiple panels. Scroll bars are included as needed. Animate Select Yes to use an animation effect when closing and opening panels.